Milan: Inter Milan ended Napoli's winning streak in Serie A with a goalless draw despite a hard-fought top of the table clash in Naples on Saturday. 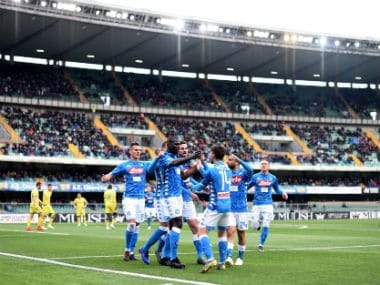 Napoli -- who suffered Champions League disappointment at Manchester City this week -- now have 25 points from nine games to maintain their two-point advantage on second-placed Inter. 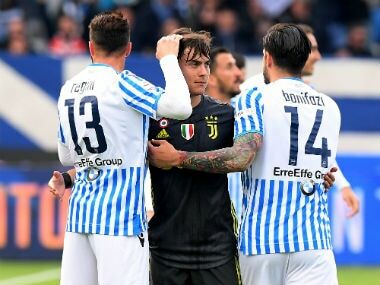 Champions Juventus and Lazio -- joint third on 19 points -- have a golden opportunity to narrow the gap on Sunday when they take on Udinese and Cagliari respectively. Napoli had been on a winning streak in 13 Serie A games going back to last season. 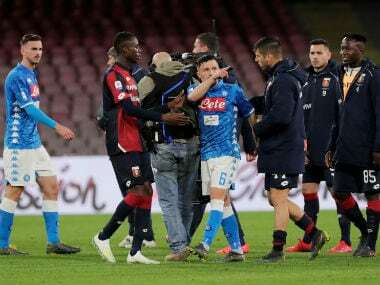 But they came up against a stubborn Inter, chasing a first win in Naples in 20 years, and who underlined their title credentials in front of 50,000 spectators at the San Paolo Stadium. Both teams had their goalkeepers to thank for the point with Inter's Samir Handanovic and Napoli's Pepe Reina pulling off some fine saves. "These players must be complimented," Inter coach Luciano Spalletti told Mediaset Premium after the match. "Today we played a very good game, which could have been even better. Napoli were very strong, they did incredible things. "Handanovic did what he needed to do. Reina also seemed good to me on a couple of occasions. We have suffered and we are keeping this (title race) close"
Napoli had more possession in the first half but little to show as Handanovic kept out a quickfire double from Jose Callejon and Dries Mertens. Reina also denied Inter's Mauro Icardi and Borja Valero just before the break. Napoli ran out of steam in the second half showing signs of fatigue after their European travels. Inter with no European commitments looked fresher, but Napoli earned the two best chances with Piotr Zielinski's long range volley on 84 minutes and a Mertens effort six minutes later both cleared. 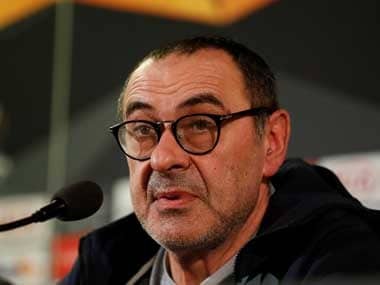 "The feeling I have is that the team have more motivation in the league than Europe," conceded Napoli coach Maurizio Sarri. "Tonight we played with great determination for 95 minutes, in Manchester only for 55. "I think it's a sub-conscious thing. If in our minds we feel more competitive in Serie A than in the Champions League, that might be a difficult thing to shake off. "We don't have that much of a chance to go all the way in Europe, but we do want to put in a great tournament performance." Both Napoli and Inter take on teams from Genoa next week. Napoli play at Genoa with Inter hosting local rivals Sampdoria, who earlier Saturday crushed struggling Crotone with a five-goal blitz to move fifth. Sampdoria, who have a game in hand, were three goals up by half-time. Gianmarco Ferrari headed in after three minutes against his former club. Fabio Quagliarella converted a penalty on 11 minutes after Arlind Ajeti dragged down Duvan Zapata, with Gianluca Caprari tapping in a third before the break. Polish pair Karol Linetty and substitute Dawid Kownacki added two more for good measure in a five-minute spree from 71 minutes as Sampdoria kept their perfect home record. "We're going through a good run of form, even if we know there are always going to be high and lows in a campaign," said Sampdoria coach Marco Giampaolo. "We will try to enjoy this moment, but without getting ahead of ourselves." Crotone -- with 19 goals conceded -- are just one point above the relegation zone after a fifth defeat. On Sunday, AS Roma travel to Torino, looking to move ahead of Sampdoria.